In Our Deal with Mullah Abdul Salaam, I concluded the discussion on the British negotiations with erstwhile mid-level Taliban commanders who vowed to “switch sides” and fight against the Taliban, their forces failing to materialize when the battle for Musa Qala began. From the Oxford Mail we get an update on the situation in and around Musa Qala. When the British captured Musa Qala, they discovered a heroin refinery in a row of derelict garages – and a stock of opium which would have produced heroin with a street value of £5m. It was burned on a bonfire. British soldiers are now sheltering in the open-fronted buildings, which offer little protection against the rain, snow and intense cold – night-time temperatures often fall to -10 C.
Up to seven heroin refineries in the district have been destroyed by the allies – depriving the Taliban of vital funds, collected through tithes from farmers and protection money paid by smugglers. But while Musa Qala’s battered, bullet-holed district centre may have been retaken, the Taliban are still out there in the hills and villages, murdering anyone suspected of collaborating with the British or Afghan government forces, ambushing convoys, firing rockets and mortars, and planting roadside bombs – so-called Improvised Explosive Devices. Ah yes, the “deep magic” of counterinsurgency. Enough money, military transition teams and roads, and the insurgency simply disappears. Military power and kinetic operations is for uneducated knuckle-draggers and brutes – creation of infrastructure is for thinkers and scholars. A variant of this view is present to the South in Pakistan, where the government is courting the idea of the implementation of sharia law in order to appease the extremist tribes in Waziristan. As I discussed in Short Lived Ceasefire with the Taliban, a truce, or ceasefire, was negotiated only several days ago between the Taliban and Pakistan, but most good analysts believe that this can only be advantageous for the Taliban. The same “deep magic” that causes British commanders to mock the idea of killing bad guys in Afghanistan also causes the Pakistani military command to call off military operations against Baitullah Mehsud and his forces in what is becoming a troubling sign of the lack of will concerning the tribal areas. This lack of will apparently runs up through the highest levels of military command in Pakistan. The announcement of a cease-fire just a few weeks into a determined military operation against one of Pakistan’s most wanted men, the militant leader Baitullah Mehsud, has once again raised questions about the Pakistani government’s commitment to combating militancy in the country’s tribal areas. 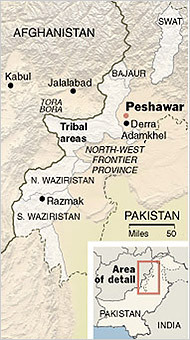 Pakistani analysts said they feared that the cease-fire was reminiscent of past deals that allowed the militants to regroup and fortify their stronghold, turning the tribal areas into a veritable ministate for the Taliban and Al Qaeda. United States officials have long voiced reservations that any further deals with the militants would be counterproductive. Spokesmen for Mr. Mehsud, who Pakistani and American officials say is linked to Al Qaeda and the attack that killed the opposition leader Benazir Bhutto, announced the cease-fire last week. The government has not confirmed it, and a military spokesman said military operations against Mr. Mehsud and his followers, estimated in the thousands, were continuing. But two senior security officials, speaking on condition of anonymity because they were not authorized to talk to journalists, said a cease-fire was in place. The cease-fire announcement followed three weeks of intensive fighting that began in a mountainous part of South Waziristan on Jan. 16, when security forces mounted a large-scale offensive against Mr. Mehsud and his forces. Reports of the clashes said scores of soldiers and militants were killed. The army imposed a debilitating economic blockade, coupled with a three-pronged operation to box in Mr. Mehsud and his militants, using the full force of the army’s arsenal, including fighter jets and artillery. The blockade was so effective that for weeks little information about the campaign emerged from the area. The campaign has been part of the most serious push against militants in several years, led by the new army chief, Gen. Ashfaq Parvez Kayani, who Western diplomats had hoped would refocus the military’s effort in the tribal areas. The acting interior minister, Hamid Nawaz Khan, suggested that military operations were bearing fruit and that the militants were on the run. “They start asking for negotiations themselves after they find themselves weak due to the military operation,” he said. The reasons for what appears to be a reversal by the government remain unclear. But given the bitter experience of past deals, and the army’s apparent readiness to pursue military operations against Mr. Mehsud this time, the news of the cease-fire has been greeted with dismay by some Pakistani analysts. In an interview, Mehmood Shah, a retired brigadier who served as the chief civil administrator of the tribal areas after 9/11, said he understood that the military operation was going well and according to plan, despite difficulties because of the terrain and the harsh winter weather. He warned that any cease-fire or peace deal with Mr. Mehsud, before his forces were sufficiently degraded, would work against the military’s goals. “The army should not be doing a deal, and in the case that they are, it would be a mistake,” he said. The “deep magic” of counterinsurgency fails its advocates, because there is a deeper magic still. Just as there are some who take counterinsurgency to be equivalent to kinetic operations against the enemy, there are also some who lurch to the other extreme. COIN is all about hearts and minds, infrastructure, reconstruction and societal stability. This ‘either-or’ approach jettisons the ‘both-and’ approach to COIN in favor of a sequence rather than a concept. Leadership is needed in Pakistan where the Taliban are being allowed to regroup and plan for the spring. Leadership is needed throughout Afghanistan where chasing insurgents brings scoffs among the military elite, and where kinetic operations against the enemy is relegated to special forces operations against high value targets and prominent personalities. The British officer to whom Kaplan talked snidely ridiculed “going after bad guys for the sake of going after bad guys.” I might also snidely retort that I do not at all advocate going after bad guys for its own sake either. Rather, I advocate “going after bad guys” for the same reason that I advocate building infrastructure and sacking totally worthless officers: for the sake of the counterinsurgency campaign and the future of Afghanistan. Prior: Doctrinal Confusion in COIN: What do you do when your forces no longer want to fight?